PTMSC Blog : Save the Date for Give Big! 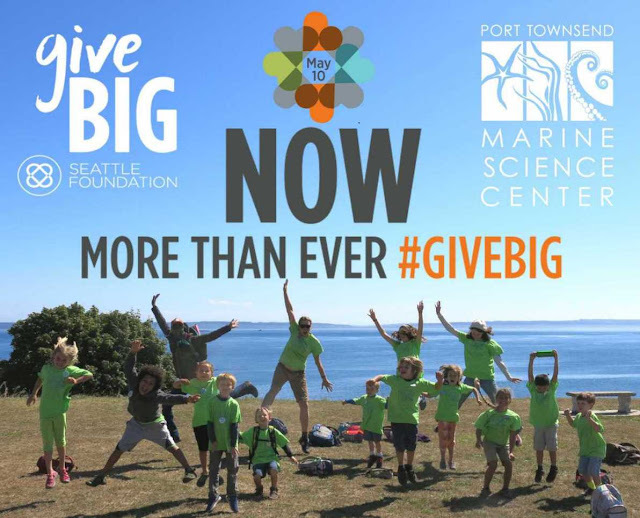 On Wednesday, May 10, the Port Townsend Marine Science Center invites you to help raise $22,000 for summer camps scholarships and capacity-building to offer more camps through GiveBIG, a one-day, online charitable giving event hosted by the Seattle Foundation, but we can't do it without your help! Thanks to a challenge match from a group of local donors, the first $11,00 donated will be matched dollar-for-dollar. The #GiveBIG campaign only lasts for one day, so follow along on Facebook and the PTMSC blog for stories and updates before the BIG day. Thank you for helping ALL kids get outside and learn to love the ocean by donating on Wednesday, May 10th! Your gift will provide scholarships for children who otherwise would not be able to attend because of financial hardship. Donations will also fund the capacity of the Center to offer more camps. Many children have already been turned away this year because of full enrollment. Plans are in the works for expanded facilities and more camp offerings. But we need your help. Learn more about GiveBig here!